Use the search box above, or start at the Library homepage. It helps to select "Limit to: Books," but this isn't necessary. Make sure the author(s) match the book you're looking for, since different books might have the same title. Reserves: Bring the call number to the Reserve Desk to check out the book for 3 hours at a time. Stacks and all other section: Find the book on the shelf using the guide to the right, or ask a librarian for help. You can search by ISBN in OneSearch Advanced Search by selecting ISBN from the "Any Field" dropdown menu. But it's best to search by title. Different editions of the book might have different ISBNs. If you can't find the book in OneSearch, you can click the "All CUNY" option at the top of the page to see if any other CUNY library has it. If they do, you can try requesting the book using the Request button. (More info on intra-CUNY borrowing.) If no library at CUNY has the book, try searching for it in public libraries. The Classic CUNY+ Catalog is the older catalog view of books, some ebooks, and some videos held in CUNY libraries. While OneSearch is now the primary way to search for library materials, Classic CUNY+ remains available and up-to-date. Start at the Classic CUNY+ Catalog. For "Electronic Resource", click the title to get to the URL /link. Every book in the library has a unique call number. Think of the call number as the address of the book, in that it tells us where exactly on the shelves we can expect to find the book. e.g. Read the number before the dot as a whole number. Read the numbers after the dot as decimals. The four books above are in the correct order. 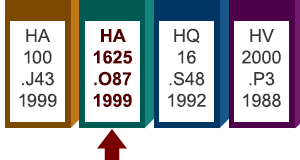 In the Library of Congress Classification system, the letter "H" indicates the social sciences class. "HA" is the subclass for statistics. "HQ" is the subclass for family, marriage, and women. "HV" is the subclass for social pathology, social and public welfare, and criminology. ebrary — Collection of 44,000 ebooks on scholarly subjects. Covers a range of disciplines, including some science. Ebsco e-books (formerly NetLibrary) — Nearly 6,000 commercially published electronic books. Covers a range of disciplines, including some science. FORENSICnetBASE — A searchable collection of over 120 reference books in forensic science and related fields. We have digital encyclopedia collections — see the full list. One of our most popular collections is the Gale Virtual Reference Library.